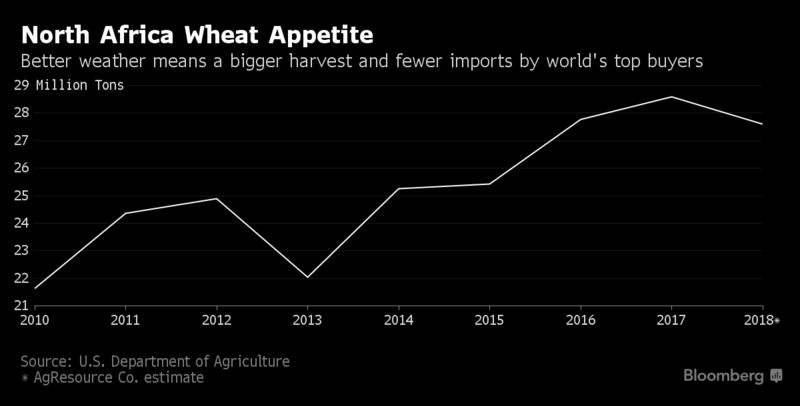 As if the global wheat surplus couldn’t get much worse, some of the biggest buyers may not need as much. That could swell stockpiles already expected to be the biggest ever. Countries in North Africa like Egypt and Algeria -- all dependent on foreign wheat to help keep their populations fed -- probably will harvest 25 percent more on their own farms this year if the weather is as favorable as expected, the International Grains Council estimates. That means imports from the region could drop from a record high to a three-year low, according to Chicago-based researcher AgResource Co. While global demand for wheat has never been bigger, output has risen even faster, and prices have plunged for four straight years. After droughts in North Africa hurt domestic crops last year, rain and mild temperatures will aid grain development this season, according to a report last month from the EU’s Monitoring Agricultural Resources unit. And the region’s weaker currencies against the dollar may further erode imports. “If you want to be bullish on wheat, it can’t be based on demand or trade,” said Dan Basse, president of AgResource. “World wheat trade is stagnant, and if we have crops that are bigger in North Africa, it makes the expansion of trade by producing countries more difficult.” Prices will need to drop further to spur demand, he said. Egypt, which provides subsidized bread for its citizens, is the world’s top importer of wheat to supplement domestic production, and Algeria is the third-largest buyer. While food insecurity is significantly worse in drought-ravaged southern Africa, the five countries in North Africa still include millions who are undernourished, according to the United Nations. The UN Food and Agriculture Organization estimates yield prospects in North Africa are “good to excellent,” based on weather forecasts. The U.S. Department of Agriculture, in a Feb. 21 report, said wet weather has left favorable conditions in Morocco as well as in Algeria and Tunisia. AgResource estimates the improved yields from better weather will boost output in the 2017-18 season to 19.6 million metric tons, up 39 percent from last year’s drought-damaged harvests. That would cut imports in the period to 27.6 million tons from an all-time high of 28.1 million a year earlier, the researcher said. In Morocco, where a drought last year cut the harvest by 71 percent and sent imports surging 64 percent, farmer Abdessamad Raiss says conditions are the best he’s seen in more than a decade. Wheat crops in Morocco, Algeria and Tunisia rely mostly on rain, though Egypt’s farms are mostly irrigated. Even in good harvest years, North Africa is still dependent on foreign grain. On average, more than 40 percent of the total cereal demand in Egypt and Morocco comes from imports, according to the FAO. In Tunisia and Algeria, it’s more than 60 percent, while Libya’s reliance on foreign supply is even greater. The five nations in North Africa will import a record 28.6 million tons in the year that ends May 30, up for a fourth straight year and 30 percent higher since 2013, according to the USDA. Over that same period, domestic production is down 26 percent and consumption has increased 9.2 percent to a record 44.7 million tons, the data show. “Imports will still be significant, and the impact on economic pressure within the countries depends not only on the input requirement, but also on the prices on the world markets,” Monika Tothova, an FAO economist, said in an e-mail. Most importers have benefited as rising global output overwhelmed demand in recent years. Stockpiles will reach a record 236 million tons this season, according to a Grains Council report on Feb. 23. Wheat futures in Chicago have tumbled by more than half from a high of $9.47 1/4 a bushel in 2012 to a low in August of $3.86 3/4. Prices are up about 11 percent this year and were at $4.51 by 1:15 p.m. London time on Friday. That’s still below the average of $6.29 over the past decade. While improving domestic supplies reduces the need for imports, purchases from some countries in North Africa also may be limited as their currencies weaken against the dollar, which reduced their buying power for grain purchases in the U.S. currency. “From a trade perspective, it could mean less reduction of stocks from other countries, making it difficult to paint a bullish picture on wheat,” said Benjamin Bodart, a director at adviser CRM AgriCommodities in Newmarket, England.